Some of the best snorkeling on the Gulf Coast, Point of Rocks is located at the south end of Crescent Beach in the heart of Siesta Key. With calm, shallow water and lots of sea life to observe, snorkeling at Point of Rocks is one of the best outdoor activities to do on your family vacation. Point of Rocks is a renowned snorkeling spot in the Sunshine State, and is known to be both family friendly and a great place to conquer your ocean fears. This hidden gem is only a stroll away from Crescent Beach and our luxury monthly vacation rentals, this snorkeling spot is a unique outdoor activity for the adventurous in your group, young and old. Before we talk about when to go snorkeling at Point of Rocks, let’s discuss how to access the most popular location for snorkeling on Siesta Key. The most straightforward access point is Beach Access 12 near Old Stickney Road. Point of Rocks is located at the southern tip of Crescent Beach (right across from Peppertree Bay). With the ocean, timing is everything. The moon controls the tides, pushing and pulling the water on a 24-hour tide schedule, and the effects of the weather are unpredictable. Choosing the time of day – and year – of your snorkel trip can make or break your family vacation. 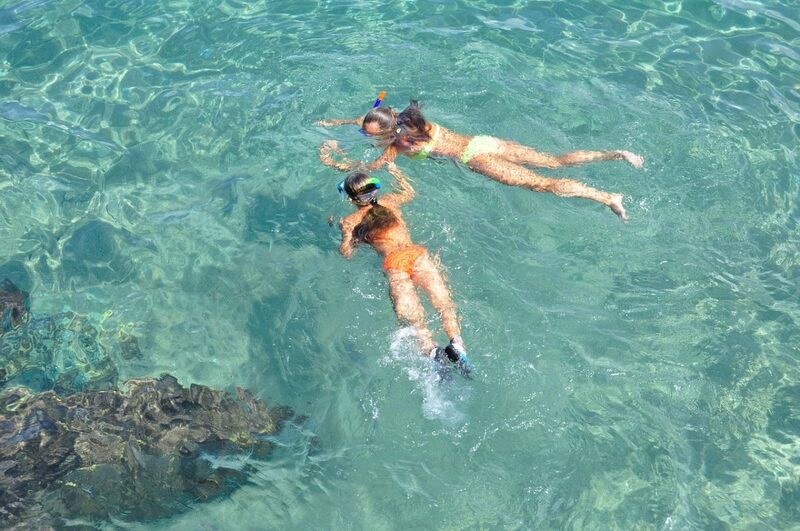 While you’ll enjoy Point of Rocks regardless, if snorkeling is high on your list of Siesta Key activities while on your family vacation, you’ll want to make sure you pick the best time to snorkel. Visibility underwater can range from a few inches to 20 feet depending on a variety of factors. Save yourself the squinting and don’t pick a dark and stormy day to snorkel at Point of Rocks. While you probably wait for a clear and sunny day for all your outdoor Siesta Key activities, cooperative weather is particularly important at Point of Rocks. An early morning snorkel beats an afternoon visit for two reasons. First, in the early morning the visibility is much better, as the wind has yet to pick up and create swell that stirs up the bottom. Second, getting an early start means that you’ll get first dibs on a parking spot in the small lot by the point. Those arriving a little later will have to hike up to the point. It might be easier to navigate the rocks during low tide, but you won’t see much of anything with the water level that low. For the best snorkeling, go when the tide is high or filling or you’ll spend the whole time wading through sharp, slippery limestone. With water levels between zero and six feet, this snorkel spot is nice and shallow. At low tide, you’ll have to scramble across the rocks to get to the other side of the point. At high tide, however, you’ll be able to swim around it easily. Whatever the height of the tide, it’s a good idea to bring water shoes just in case. While there’s plenty of wildlife to see year-round, the warm months attract manatees, the gentle giants of the sea. The rest of the year, take a look for snook, crabs and other crustaceans, red sponge, and lots of shells, as well as algae and sponges. Coral is also visible here, including some bright pink ones. Dolphins are frequently spotted by snorkelers, so keep your eyes peeled below and above water. For beginners, Florida Underwater Sports offers guided snorkel tours of Siesta Key and dive courses. They also have a shop where they sell snorkel and dive equipment. These days, you can pick up a pretty decent mask, snorkel and flippers at several retailers. And if snorkeling’s not your thing, try a dolphin tour, boat tour, or just lie in the sun!